Jon Aquino's Mental Garden: Lifehack: Hacky Sack -- The Perfect Exercise For Geeks? Lifehack: Hacky Sack -- The Perfect Exercise For Geeks? 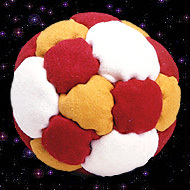 Footbag (or "hacky sack") could be the perfect form of exercise for tech geeks. Note: Be sure to get a sand-filled footbag, rather than those leather or crocheted pellet ones. Sand-filleds give you way more control. posted by Jonathan at 7/15/2005 10:14:00 p.m.
By perriger, at 7/22/2005 4:46 p.m.
Hi perriger - Tai Chi, hey? Good for you for finding a type exercise that works for you. By Jonathan, at 7/23/2005 11:10 a.m.
As a true geek, I use one made from chainmail. Good for exercise, _and_ for chasing away those annoying folks who continue to bother one while at work! By Floozle, at 9/18/2005 9:56 a.m.
Chainmail? Floozle you are a true geek indeed. By Jonathan, at 9/19/2005 9:44 p.m.
but do you know the pattern they used??? By Anonymous, at 11/22/2005 6:07 p.m.
Hi Anon - pattern? You mean the seam pattern of the footbag depicted in the picture? By Jonathan, at 11/22/2005 10:19 p.m.
Guarenteed to blow your minds! This is more than really good hacky sack. This is a completely different sport. Hope you like it. By Evan Lovely, at 12/05/2005 12:34 a.m.
By Jonathan, at 12/05/2005 11:37 p.m. I just wanted to say sorry for saying "you guy don't know anything" It was late and it just kinda came off the tips of the fingers. Hope to hear you that you get to check them out and enjoy them. By Evan Lovely, at 12/08/2005 8:22 a.m.
By Jonathan, at 12/09/2005 7:56 p.m.